Editors: Neuhold, C., Rozenberg, O. and Smith, J. 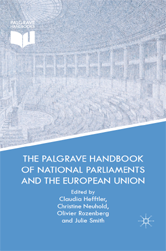 This handbook offers a comprehensive picture of the European activities of national parliaments in all member states of the European Union. In the aftermath of the Lisbon Treaty, it assesses the extent to which national legislatures actually matter in European governance.